As Christmas approaches, kitchens far and near bustle with the sights, smells and tastes that tantalize our senses. Even now, I can close my eyes and smell Grandma’s pumpkin bars. She’s been gone for years, but the beautiful memories of her serving these during the holidays rush to the forefront as if it were yesterday. This recipe now garners praise as one of my favorites, and most recommended. I eye the plates of Christmas cookies decorating the festive plates, and think of Christmas morning. Just after our children wander downstairs, they tear into a piece of my mouthwatering homemade cinnamon rolls, even before the first present cracks open. With eyes still closed, I meander through more senses of the season, and hear the cheers, screams and high-fives that resound from the family room during the afternoon basketball and football games. Bite-sized sausages drenched in barbecue sauce simmer all day in the slow-cooker, only to be devoured in moments, and the guys fight over who snags the last one. There’s something so special about the way family recipes create lasting memories, and yet often we don’t take the time to gather those recipes until it’s too late. 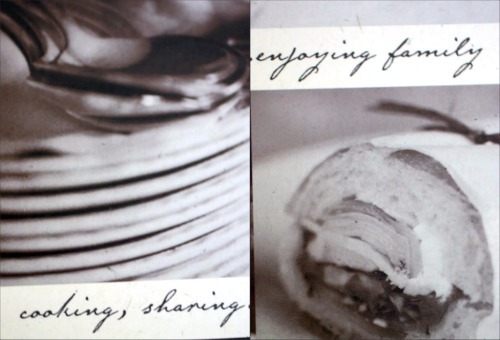 One of the treasures I want to pass on to each of our children is a family recipe album. I’m slowly gathering up those recipes that are consistently served at family gatherings, and not only am I requesting a handwritten recipe card (there’s just something special about “old-fashioned” handwriting), but the story behind the recipe, and any funny or serious details. As I hear how the recipe first came about, it makes preserving that heritage even more important. I want to know when the recipe was first served, and why. Where was the recipe found? Was it a personal creation, a cookbook or possibly passed down from a grandmother? All those small details help transform the family recipe album into something more than just some good “go-to” recipes. The stories and emotions make the recipes part of our family legacy. They create a thread that showcases the power of time spent together in the kitchen. Since many who know me in real life understand how passionate I am about creative and meaningful gifts, a friend requested ideas for her mother’s 60th surprise party. I shared the recipe album idea and recommended that each guest bring a picture of herself with her mom, along with a favorite recipe. The album pictured here was purchased through Once Upon a Family , but you can easily make your own. 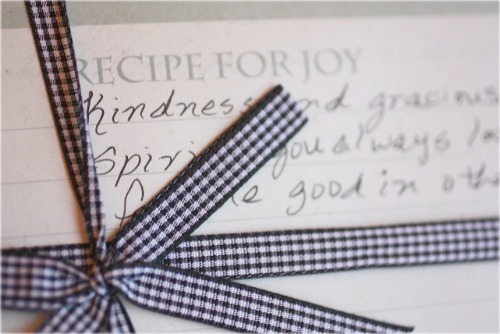 Not only that, but we shared a template for a “recipe of joy.” Each guest wrote down on her recipe-of-joy card one way in which the honoree brought joy to her life. She gathered all the food recipes and combined them into the album with the pictures and recipes of joy to create a gift that will be passed on through the ages. She said her mother cried as she paged through this priceless heirloom. As Christmas approaches and we are all contemplating the “perfect” gift idea, why not give a recipe album to someone who understands the beauty that comes through shared experiences in the kitchen? As I gift one to each of my children for their weddings, they may not quite fully appreciate the impact it will have immediately, but as it is passed down generation to generation, it will become an heirloom for the ages. 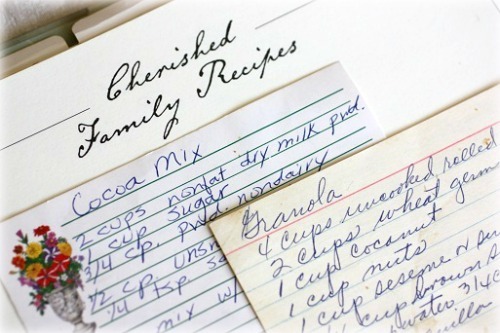 Do you have any old family recipes that have been passed down through the years? I have made two recipe scrapbooks for my 25 yr old twins…all our/their faves are in there, with pix of them and the person whose recipe it is-so nanny’s meatballs are on a page with the kids and their nan! It was quite a labor of love, but worth every hour spent curating/assembling. Oh Susan – do you have any pictures of it? I would love to share it on a follow up post. Great idea! I hope to pass family recipes down to my girls. I have several in my moms handwriting and she wrote how long it’s been passed down..ie..great grandma-grandma-ma-mom…so we could see how many generations have made it. LOVE IT! My aunt did something similar for a wedding gift for me. My great-grandma’s rolls were legendary, but she died 11 years ago. My aunt xeroxed a copy of the recipe in my great-grandma’s writing and framed it. It was (and still is) my favorite wedding gift! I have a couple memory books similar to this.. I agree with you.. family mean everything to me (and my family) and we’ve done pretty good to preserve much of it..
One of my familial lines got all the family together and asked each one to submit recipes from their family along with any family newspaper cuttings or any other memorabilia. They did all the genealogy, including my grandmothers couins (who were all in their 8os at the time) drawing of our family tree. Recipes were included from my great grandmothers scrapbook for food, quilting squares, health remidies, household hints including bed bugs and cures for scurvy and cholera..
My ex husbands family did much the same thing. 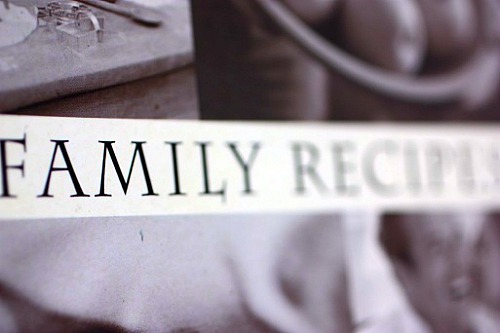 There is no genealogy in it but everyone contributed recipes and photos and a few hand written memories in them. They had them bound with plastic comb binding and its wonderful to have and read. The recipes for food, canning, quilting, and all the things that I love and cherish are safe for now.. I should make books for our kids now.. Thanks for the idea..
Oh my, Kim – what a GIFT!! Can I share what you wrote or would you be willing to write a guest post for me on that? Do you have any pictures? I’d love to show what others have done. Since mine is going to be a new tradition, I don’t have all the history behind it like yours will, but I sure hope I’m starting something like your family. It would be quite easy to take some photos of the books & some of the contents inside them. They arent pretty but they contain a wealth of information that means everything to me. My mother & her sisters also belong to a community club out in the country where they all grew up and made community recipe books to sell as a fundraiser, and all our favorites are in there as well. They’re more like family than not, but its another wonderful way to preserve your favorite recipes. @KimH, I wanted you to know that I haven’t forgotten about following up…it WILL come!! 🙂 I am a tad behind. Your lovingly prepared books definitely will become heirlooms! I treasure my family recipes and have been thinking about ways to preserve them. I also have a collection of recipes that my mother in law put together with the help of my sister in law and my husband, illustrated with their childhood drawings. The recipes are such a part of our family food history, one I am keen to share for future generations. Would love to make one for my family.